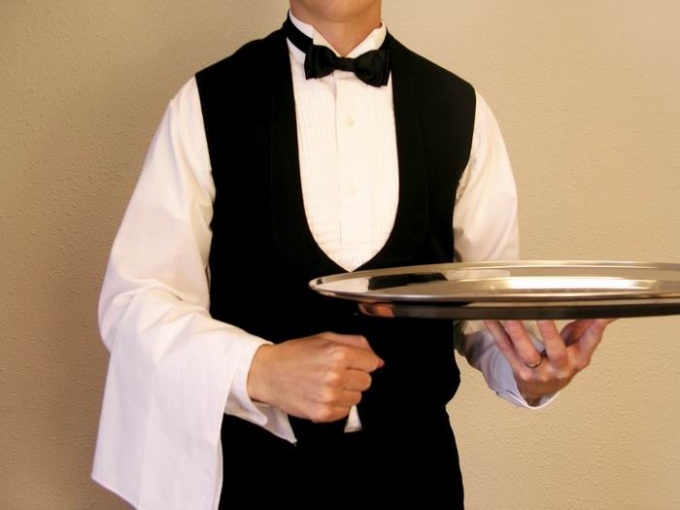 Work as a waiter – great extra income for students, because it allows you to earn money in your spare time. However, as in any other profession, there are challenges. At first glance the only thing that is required from the waiter to take an order from a guest of the restaurant or bar, send him to the kitchen, and then submit the finished dish. But not all people can be truly good waiters. It is not only the physical requirements, although they are important, because the waiters spend their working day (or night, if you work in a nightclub) in constant motion, resulting in a shift have to walk a few kilometers, and half with heavy trays. Among the required qualities apply and a good memory, and stress, and charm. Although most of the waiters work temporarily, some consider this position as the beginning of a career in the restaurant business. On service quality pay attention to almost everything the guests. So the waiter must be polite, helpful but unobtrusive. During training, waiters learn the menu is not worse than the cooks, because this is what visitors are asking, how prepared a particular dish. In upscale restaurants, the wait staff needs in addition to navigate the wine list, well-versed in the intricacies of making cocktails. In addition, an important role is played by the sequence of meals and drinks, and this requires not only knowledge of the standards of table etiquette, but also constant communication with the chefs in the kitchen. The visitors often only adds stress to the waiter. Usually each waiter serves several tables and forced to follow the time of filing of each dish, being careful not to mix up the orders. For all the mistakes the cooks and the visitors, too, pays the waiter who has to apologize for the shortcomings of the cuisine and to look for compromise solutions, if the guest ordered the dish. "Tips" can be up to half of the total income of the waiter, as the official salary is quite low. Finally, the work of the waiter is to work with people who may behave differently. Any restaurant tries to win the loyalty of regular visitors, leaving a generous tip, and not requiring the impossible. However, most guests initially positioned themselves as superior staff, that communication with them brings a lot of discomfort, which in any case cannot be demonstrated. In addition, there are cases of inappropriate behavior of guests, attempt conflicts and scandals. The waiter should be able to avoid such situations, and if they are already there – to settle as quickly as possible and unobtrusively to other visitors, not to spoil the reputation of the institution.